Completely rejecting the typical, Western division between the natural and the supernatural, Dreyer shows us a world where God is incarnate in the ordinary and where spiritual transcendence occurs in the face of oppressive religiosity. Kierkegaard writes in his Journals that “it was intelligence and nothing else that had to be opposed”, and Dreyer shares this point of view regarding the limiting nature of rationalism (2). Born in Copenhagen in 1889 to a Swedish mother who died in childbirth, Carl Theodor Dreyer was adopted by a Danish family and given a strict puritan education. Going to work for the Nordisk Films Kompagni in 1912, he worked on many film projects as a writer of titles and scenarios, making his directorial debut with President in 1919 and following it that same year with Blade af Satan’s Bog (Leaves From Satan’s Book). After the success of his seventh film, The Master of the House (1925), he was invited to France where he made his first acknowledged masterpiece – La Passion de Jeanne d’Arc (1927), one of the last great silent films. Vampyr (1932), his first sound film, is a cult vampire movie that shows a strong influence of German expressionism. However, it is Vredens Dag (Day of Wrath, 1943) and Ordet (The Word, 1955) that represent the full expression of his world-view. In Dreyer’s films, faith in God and the supernatural is never ridiculed, explained away or reduced to psychology. It is always a faith well placed because the spiritual realm is as present and real as the material realm, and both are completely interwoven. Although Dreyer is always a “severe, uncompromising critic of organized religiosity” (3), he is also always an inspired champion of incarnational spirituality. As film scholar Raymond Carney points out, “The expressions of the senses and the spirit are never separated or opposed in Dreyer’s work as they are in traditional Christianity…. For Dreyer, our bodies are the way we express our spirits” (4). Set on a 20th century Danish farm, Ordet is about Morten Borgen, the Lutheran patriarch of the family, his three sons who have all strayed from their father’s way in their own individual ways and Inger, the woman who brings them all back to the fullness and beauty of life. The oldest son, Mikkel has completely lost his faith, “Not even faith in faith” as he puts it with a smile; however, his pious and earthy wife, Inger, believes he will come around because of his good heart (5). As she tells him early in the film, “It’s not enough to believe, if you aren’t a good person as well. Which you are”. Priest: Was it – love? Mikkel: No, no, it was Soren Kierkegaard. I am a mason… I build houses… but people refuse to live in them… They want to build for themselves. They want to, but they cannot. And so they live, some in unfinished shacks, others in ruins; while the greatest number wander about without a home at all. Anders: What’s wrong with me? Peter: What’s wrong with you? You’re not a Christian. Anders: I’m not a Christian? Peter: No, not what we down here understand by Christian. Peter: That may be, but you’re not of our faith, and that’s what I look for. Of course, when Anders is rejected, his father is offended and proceeds to do everything possible to make the match happen. It wasn’t God’s fault but my own. If I’d prayed with faith the miracle would have happened. But I prayed because it was worth trying. And when a father can’t pray with faith for his own child – then miracles don’t happen. In the structure of Ordet, if Johannes, on the one hand, represents a state of spirituality estranged from social involvements and practical, worldly expression of its ideals, and Morten and Mikkel (along with the doctor, and, to a lesser degree, the minister), on the other represent conditions of human caring and involvement that have largely lost touch with, or faith in, spiritual realms, then Inger and Maren alone represent the possibility of drawing together the realms of the spirit and the body, the realms of love and the practical world of men and affairs (6). The other characters in the film seem to sense her special qualities, and invest in her all of their different hopes and dreams. Although I have tried hard to discuss Ordet without taking away from the pleasure of an initial viewing, it is impossible to talk about the significance of the film without revealing the ending – an ending absolutely unique in the history of cinema. During the course of the film, Inger’s child is stillborn and she dies in childbirth. Mad Johannes, shocked by the tragedy, runs away in the night, and he comes back home in his right mind to attend her funeral, no longer under the delusion that he is Jesus Christ. However, as everyone grieves around her bier, he asks why no one has asked God to raise her from the dead. Quite reasonably, the family thinks he has slipped back into his mania, and the viewer cannot help but share their feelings. Johannes rebukes them (and by extension the viewer) for their lack of faith, saying: “Inger, you must rot, because the times are rotten”. Then because of the faith of a little child, Inger’s daughter Maren, Johannes raises Inger from the dead “in the name of Jesus Christ”. The scene is done with Dreyer’s unflinching realism. As Mikkel embraces her and she kisses him passionately, the viewer is inescapably confronted with Inger’s bodily resurrection, truly one of the most stunning and oddly uncomfortable moments in all of cinema. 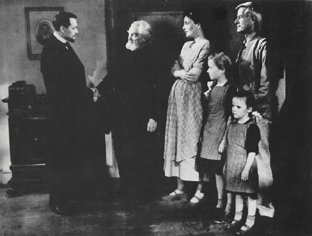 Unlike supernatural thrillers or even a Bergman metaphysical drama, the story presented to us has been completely realistic, even – despite the piety of the characters – naturalistic, and in the end, what we see is the actual (as opposed to metaphorical or symbolic) intrusion of divine grace into the droll world of the Borgensgaard farm. Mikkel’s conversion is unequivocally achieved by the miracle. Just as Inger has been a means of grace to everyone in her family alive, her death gives grace to Johannes and her resurrection gives grace to Mikkel. Dreyer offers a radically revisionary reading of Christianity that argues not only that the resurrection must be substituted for the crucifixion as the central Christian event, but further that, to truly count, the resurrection must be a resurrection to the physical body with all of its needs and cravings (7). Traditional Christianity has always seen the resurrection and not the crucifixion as the central event. Belief in the bodily resurrection of Christ is what makes Christianity unique among world religions, unique because it affirms the Incarnation, the eternal union of flesh and spirit, thus destroying the classical temple of Greek rationalism (8). However, when one considers the state of modern Christianity, it is easy to see how Carney would think of Dreyer’s vision as revisionary. Christianity has largely become Manichean, separating the spiritual realm from the material realm. Modern believers tend to use the spiritual realm to justify their material well being in this life and assure themselves of a happy after-life. …for him [Kaj Munk] there was no difference between sacred and profane love… He understood that God did not separate these two forms of love. That is why he did not separate them either. But this form of Christianity is opposed by another form…which establishes a divorce between thought and action (9). Dreyer believes the bodily resurrection means that God loves our bodies as well as our souls and that he wants to be fully involved in our material lives as well as our spiritual lives. In our digital age, we are being inundated with movies that question the reality of the real and encourage us to retreat into fantasies that have very little to do with the real world, to the point that it is no longer only the ivory tower that doubts the material being of the world. Dreyer’s every frame gives us back a solid, real world. And if, in the minds of many, life is now nothing but a dream, any transcendent encounter with a personal God is now not even a dream; it is a delusion from which we have thankfully awakened. Any belief in the supernatural is relegated to the harmless realm of the personal and subjective. Dreyer’s films, however, all insist that the supernatural is real and ever-present, with or without our consent. Carl Theodor Dreyer, Four Screenplays, 1970, p. 245. All subsequent quotations of dialogue taken from this source.